The real reasons teachers are striking need to be accurately understood for the struggle to continue. Though it is possible that the Teachers’ Strike in Chicago may be finished today, with the students of Chicago’s public schools back in class by Wednesday, many of the original demands laid out by the Chicago Teachers Union have not been discussed and put into writing to the satisfaction of its members. One of the most controversial and complicated of these demands is the rehiring of laid-off teachers–namely, that new positions and openings in schools go to the pool of educators who have recently lost their jobs, as opposed to newer teachers. Because of this demand, mayor Rahm Emanuel is threatening to place an injunction on the strike, suing the Union for acting on terms outside of the legal agreement that teachers may strike only over issues of salary and/or working conditions. He made a similar threat last week after the CTU and CPS came to a tentative agreement about incremental salary increases. When Union leadership came out and said that pay was not the issue, hoping to combat portrayals of ‘greedy teachers’ in the media, Emanuel accused them of continuing the strike without the reasonable cause of salary discrepancy. The Union was forced to keep the question on the table, and to continue bearing accusations from the media. This new threat of injunction touches an even deeper political nerve, specifically the battle between public or privatized education as the future of the city’s school system, and begs the question whether the organization of teachers in Chicago will evolve from a strike into a protest. Most representations and discussions of the issue of rehiring laid off teachers of have either failed to interrogate the issue’s significance, or else have chalked it up to the most dominating political myths of the times: Unions have too much power, and are working to muscle in positions for inept teachers who are members of their union. These limited reactions demonize unionized workers and the struggles of the labor movement, making the assumption that teachers are fired for doing a bad job, and that the Union is trying to force incompetent educators back into schools. While the role of unions in protecting teachers who have not held up their own as members of their school communities is a real discussion, it does not examine the true reasons why so many teachers in urban districts have been losing their jobs in recent years. High stakes tests–which we know do not measure the competence of teachers or learners, but rather the socio-economic status of students–have caused many of the educators of poor and Brown youth to be labeled as failures. The active push on the part of business and government to use the label of ‘failure’ to justify the mass closings of public schools, handing them over to private ventures who hire young, impressionable and non-unionized teachers to replace veterans, is another. There is even recent evidence that Chicago teachers who were performing up to standard in every way monitored by the state have been losing their jobs for being actively involved in union organizing: Two of the founding members of the Social Justice High School in Little Village, two of its total of three English teachers, were fired from their posts before the start of the school year, told by a new principle that their jobs had been eliminated for “economic purposes.” All of these factors add up to a calculated attempt to undermine and defame organized labor and worker power, for the purpose of establishing the education of oppressed people as a for-profit venture. 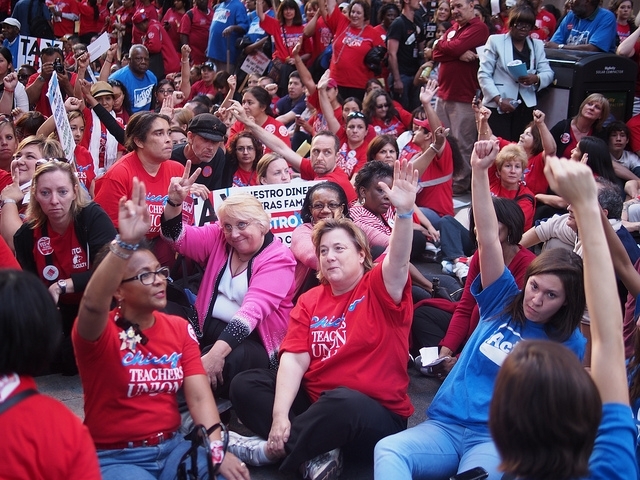 The Chicago Teachers Union and the strike it has incited toe many complicated lines in the demands it is making, the bodies which support it, and the systems which it is fighting for. Yet it must be understood that the battle over fired teachers is not about a conflict of egos, or a self-interested attempt on the part of teachers to win jobs for their own, even if they are undeserving. It is, as the Union states, about the battle for public education, a struggle against the neoliberal reforms pushed by the Obama and Emanuel administrations, and a fight to keep business models out of the classroom. This point, though it has been well and repeatedly articulated by the CTU, other supporting unions and workers, and educators around the country, has not been accurately addressed by any major media source, and is unlikely to be. The struggle of the teachers in Chicago, and the battle for public education around the globe, have helped push the issue of privatization in education into a more mainstream forum. It has been brought up as a possibility that other teachers’ strikes may be beginning around the country. I am reminded, as the battle continues, of organizing and activism around Planned Parenthood which took place just a few years ago. Thousands protested when it was announced that huge amounts of government funding would be cut from the national program (another struggle which continues), and communities mobilized for their sexual and reproductive rights. While I supported these protests, I was also struck by how strange it felt to have to organize and fight for a program which had originally been instated because of anxieties about the threat to resources which the overpopulation of undesirable communities represented. While I value many of the resources which Planned Parenthood now offers, it was surreal that my community and I had to engage in argument to get them. I feel similarly now in the battle for public schools. Public education in the U.S. is not an institution to which I feel a deep allegiance, and one which I still believe stands in the way of the health, wellbeing and empowerment of my communities in many ways. That we as oppressed people should have to fight for a government-sanctioned education rather than a for-profit business model illustrates the true state of emergency which we face. Teachers are not the cause of this emergency. They are simply, like all of us, fighting to understand what needs to be done to survive it.